Since my arrival at MHCAM in the fall of 2016, I have been struck by how Mount Holyoke fosters such loyal connections with its students during their time here and beyond. As a testament to this, influential alumna artist Joan Jonas ’58 returned to campus as our Leading Woman in the Arts speaker during the fall of 2018. This special visit provided unique and memorable opportunities for our students to engage with Jonas, who has been a pioneer in video and performance art since the 1960s. In concert with her lecture, the Museum is presenting a yearlong, focused exhibition that examines her ongoing use of the mirror, Promise of the Infinite: Joan Jonas and the Mirror. What has also impressed me is the breadth and variety of alumnae who have committed themselves to the visual arts, whether as artists, such as Jonas, or as curators, art historians, gallerists, or patrons. Last April 2018 we hosted our Director’s Circle tour in Cleveland, which boasts a vital and growing art scene. Fourteen MHC alumnae, with several spouses joined us, and local civic leader and art philanthropist Leslie Dunn ’67 generously co-hosted our welcome reception at MOCA Cleveland, where tour attendees mingled with other local alumnae committed to the arts. Indeed, I continue to be inspired as I meet more and more alumnae who possess a deep appreciation for the visual arts, and for many, this love can be traced back to their time at the College and their experiences at the Museum. 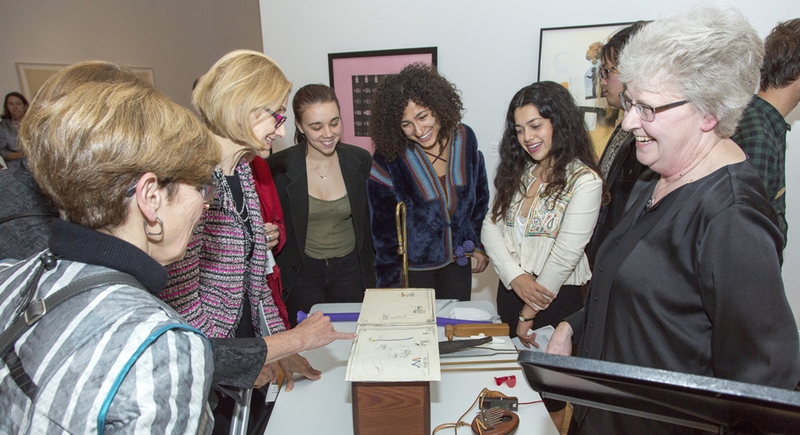 We at MHCAM believe our exhibitions and programs enrich Mount Holyoke’s distinctive liberal arts education. In small and profound ways, we help shape the future of our alumnae, whether as medical students who have learned observation skills in biology classes held at the Museum, law students who have trained in our Student Guide program, or as burgeoning artists who have presented their senior theses in our Museum lobby. Another way we are showcasing how the Museum enhances our students’ liberal arts experience is through our two-year exhibition Major Themes: Celebrating Ten Years of Teaching with Art, on view through June 2020. Throughout the installation and other galleries, visitors will have an opportunity to experience a sampling of the innovative connections students and faculty make between original works of art and course topics. They will also be able to read the incisive labels written by our student and faculty collaborators. We look forward to welcoming our talented students, committed alumnae, and engaged community visitors to an exciting roster of exhibitions and programs this year as well as in the years to come.